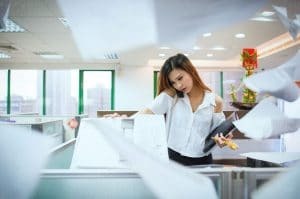 If you are looking for save money on your monthly spending then we would suggest looking closely at your office copier expenses. How much do you spend every month on supplies? Are there areas of waste? The biggest questions to consider is who manages your copier and can answer these questions? Having someone around to manage your copier or printer can be a great way to save yourself money every month. There are two good options when it comes to managing your copier. You could either assign someone in your office to be the copier manager, or higher a managed print services company. This can be a great option if you are strapped for cash. You can choose someone who already works for you to take the responsibility. This person should be organized and good at finding patterns. You want them to be able to be there to help you find waste and eliminate unnecessary spending. This is a great way to solve your problems without spending too much money, but you employee could miss something. This is the most thorough solution to the problem of managing a copier. A managed print services company will be entirely dedicated to monitoring print and copier usage. They will be able to give you detailed reports of everything and find just about any area where you may be wasting money. This is the most complete solution, but it does come at a cost.